It’s that time again: election time. 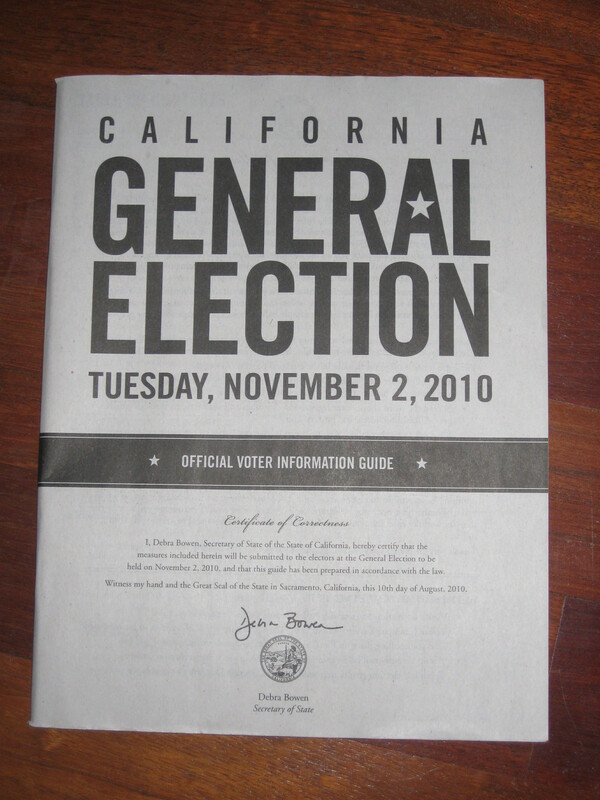 I recently received my California General Election information guide in the mail, along with my absentee ballot (I’m on the permanent absentee ballot list because I find it encourages me to vote). And once more I prepare to climb into the morass of trying to figure out who and what to vote for, which involves trying to find information about people I’ve never heard of and wading through dense legalese. Some quick statistics, based on numbers I found here and here. California has an estimated 18-and-over population of 27.7 million. As of April of this year, there were 16.9 million registered voters in the state. Some easy math tells us that only about 61% of those over 18 are even registered to vote (leaving over 10 million adults in the dust). And of course, just because someone is registered doesn’t mean they’ll actually cast a vote in any particular election. Voting is very important to me. I feel lucky to have the chance to participate in my government and to have duties as a citizen. But when I’m faced with my 127-page information guide (which does come in languages besides English, I am happy to say, although how easy it is to obtain one in the correct language is outside of my experience), I’m not so shocked that only sixty percent of those eligible elect to participate (or even have the possibility of participation). In fact, I’m surprised it’s that many. It takes a lot of time for me to vote, and it causes me a fair amount of anxiety. I read the text of each proposition carefully, trying to understand what it actually says, and I usually pop on the internet and have a look at the opinions of a few established groups. And then I hope I’m actually understanding something outside of my expertise and cast my vote. In this year’s election, I will go through this process ten times, once for each proposition. Then there’s the propaganda problem. Thankfully I don’t watch TV so at least I miss the commercials, but when digging through available information, how do I know who to believe? And while I’m willing to dig through the voting records of presidential candidates (during primary time, since by the final election I only have two choices anyway), do I really have time to do so for every single candidate on the ballot? Hmm. So I muddle through the ballot, doing my best to make responsible, informed decisions and sometimes falling short. If I weren’t so personally invested in my voting rights, I could see getting lazy and just not bothering with the whole thing, since it often results in my feeling helpless and/or stupid. Yet another instance in which my stubbornness comes in handy, forcing me to do the right thing. Because voting is the right thing. No matter how unpleasant or confusing, no matter how complicated or mysterious, casting my vote is a concrete action in the face of widespread apathy and ignorance. It says that I care about my country, I care about my fellow citizens, and I care about my hard-earned right to have a say. It says that I’m not taking the status quo for granted. It says that I believe each one of us is involved in creating the world we live in. Are you planning to vote in November? If not, I hope you consider changing your mind and joining me in the baffling yet important process of participating in our government. Yes, I figured out about the local elections right before your comment. More data to collect…. I’m exactly in the same boat. I resolutely ignore all propaganda leveled my way (the robo-calls are paricularly annoying) and get my information on the candidate based on his/her website. What issues does she/he think are most important? If I were really into politics, I would have an idea of the character of these people, but alas, I’m not. I see voting as a test I study for, and then forget about once it’s over. I’m not above asking the opinions of politically-savvy people I trust. Eg. I always ask my public-defender friend who she thinks are good judges (“all of them” she said last time) and/or who to vote for for sheriff (anyone but Arpaio). Oh, that’s a good suggestion about getting trustworthy opinions. Unfortunately, I don’t know a lot of people who care about local politics in particular, but I’m going to start keeping my eyes open. 61% is far above the American average. It’s not a great number–it’s a sad number, I think–but 61 is pretty high comparatively speaking. Because I live outside the country, I can’t vote in US elections, except for the president. No Senator or Representative for me! Y’know what I think would increase US voter turn-out? If for every American who could vote but didn’t, a random foreigner were allowed to vote in their place. If people knew that not voting would mean some random person in Nicaragua or New Zealand would get to cast a vote, I expect it would take an extremely apathetic person to throw their vote away. Of course there’s something to be said for not voting when you really have no preference of one candidate over another. It would be nice if there were a ‘no preference’ option, just to let people indicate that they thought about their options, and could not find a real reason to vote for any particular candidate. That would speak much more clearly than does not voting at all. Ha ha, Rich. Very funny. But seriously, if we’re talking about what could be done to make it better, I do think that there might be a way to make information about candidates more easily available. In fact, I was talking to a friend from Oregon and it sounds like they have a slightly better system. I love that I get to be part of the process, but can absolutely see why turnout is low, and why so many people don’t vote. It’s an absurd process if you want your vote to be meaningful (to yourself), and other than a few major issues and candidates, it can be very difficult to find unbiased information. Yeah, I’ve seen some people get righteously angry at those who don’t vote, but I find it very understandable. I still wish more people would go out and vote, but the obstacles are much higher than I thought they’d be when I was a teenager learning about the system. Just be happy that you don’t live in San Francisco. We have 15 city propositions to vote on including ones that have poison pills for others. I’m surprised they haven’t included recursive propositions and meta-propositions or I’m sure we would have them to.